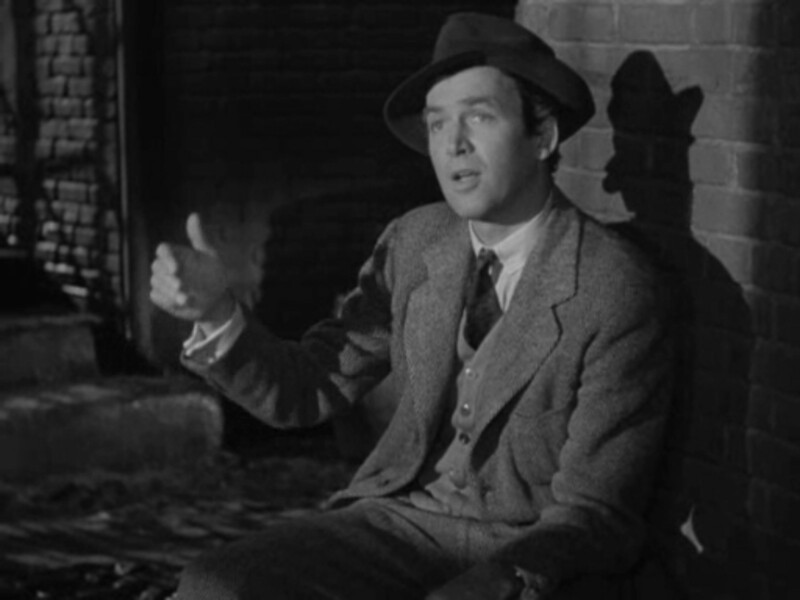 Noncomformist Elwood P. Dowd (Jimmy Stewart) spends his days drinking in bars and chatting with his invisible rabbit friend, Harvey. 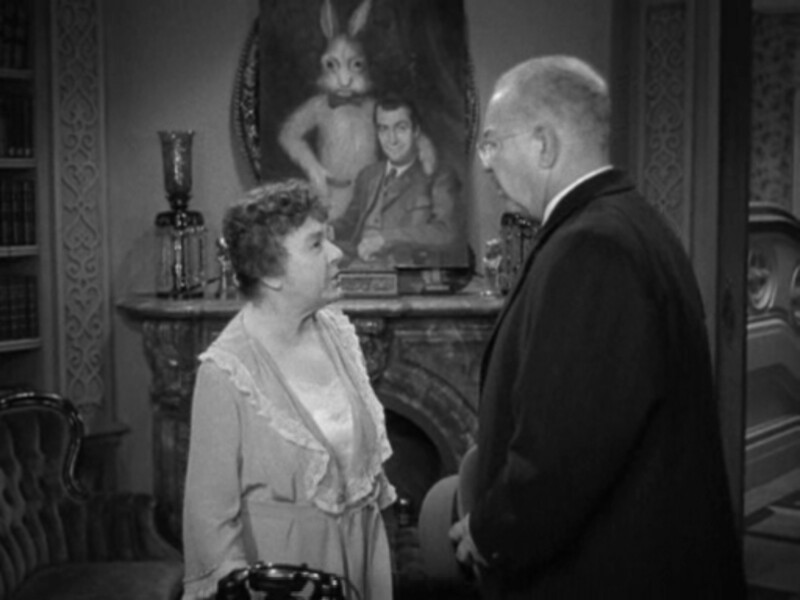 When Elwood’s sister (Josephine Hull) becomes convinced that his quirky behavior is preventing her grown daughter (Victoria Horne) from finding a suitable husband, she takes him to Chumley’s Rest Home, where a well-meaning young doctor (Charles Drake) targets her as the delusional one instead; meanwhile, Elwood befriends the asylum’s founder (Cecil Kellaway), who soon believes that Harvey is real. Mary Chase’s Pulitzer Prize-winning play was an enormous hit with post-war audiences, opening in 1944 and running for 5 years before finally closing and re-emerging as a feature film. It’s an unusual, whimsical fable which poses the enduring philosophical question of who’s really crazy in this world — those who live life peacefully while talking to an imaginary 6’3″ rabbit, or those who care more about social status than inner happiness? Because Elwood is ultimately not the only person who “sees” Harvey, it’s difficult to know just what to make of him; he should perhaps be viewed as simply a fantastic reminder that attitude is the essential key to happiness. Elwood, for instance, likes to invite anyone and everyone he meets to “come have a drink” with him, and this open-minded acceptance of all humans — rich (the asylum owner’s wife) or poor (the asylum’s gate-keeper) — is a poignant, important lesson. With that said, despite its cult status, I don’t find Harvey all that compelling as a film; considering that it’s a comedy, there aren’t nearly enough laugh-out-loud moments or lines. The central dilemma of whether or not Elwood will get committed to Chumley’s is self-evident (how can we not know the outcome ahead of time? 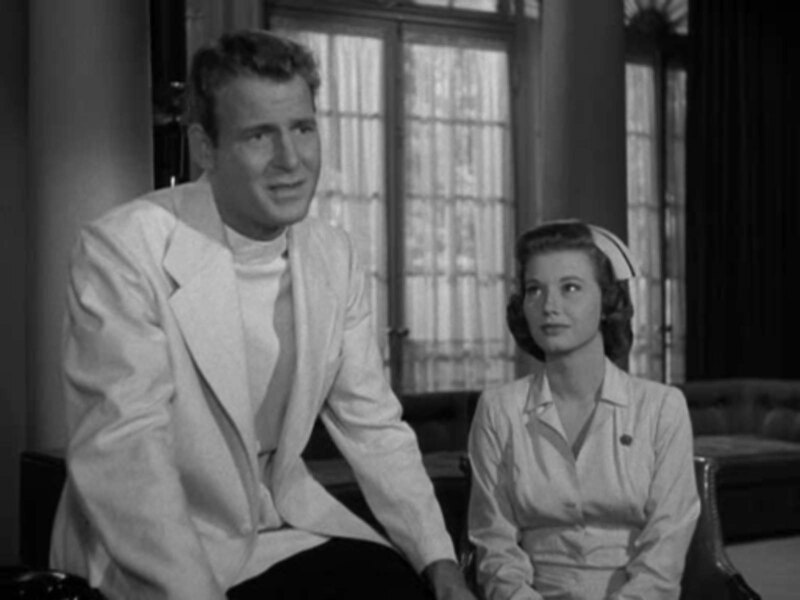 ); and the unrequited “love affair” between stodgy Dr. Sanderson (Charles Drake) and loopy Nurse Kelly (Peggy Dow) — which supplements the central story — is amusing but ultimately beside the point. 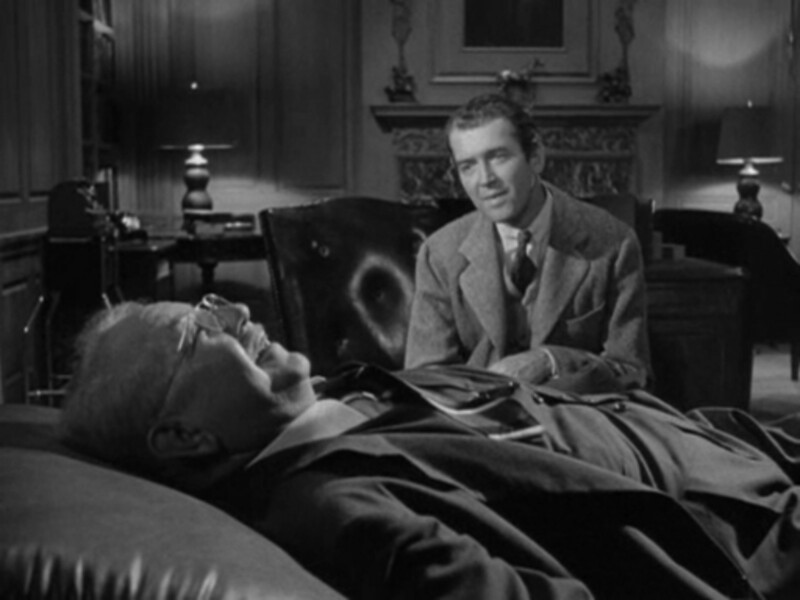 It’s the performers rather than the story who make Harvey worth watching: Jimmy Stewart — who lobbied for the role, and reprised it again years later — is perfectly cast as the nonconforming, good-natured Elwood; Josephine Hull, who won an Oscar playing Elwood’s frantic sister, is appropriately ditzy (though I prefer her more subdued performance in Frank Capra’s Arsenic and Old Lace, where she’s the “crazy” one); and the remaining supporting actors — particularly Dow, Kelloway, and Horne — are all fun to watch. Yes, for its status as an Oscar-nominated crowd pleaser. Listed as a cult movie in the back of Peary’s book. Ultimately, despite its place in cinema history, not a must. That is a marvelous line. As well, in the last ten minutes of the film, we are suddenly introduced to a new character – a taxi driver – and, through him, we come to learn not only a very important piece of information but also why the world needs many more people like Dowd in it…just the ‘eccentric’ way that he is. Unfortunately, what’s great about ‘Harvey’ all comes right before the end of the film – and it’s a rather dull affair getting there. (The bland, sit-com way in which it is filmed doesn’t help either.) In a story in which character development is expected to take center stage, it’s the situation that holds sway. As audience members, we spend most of our time from the get-go watching various characters freak out over the protagonist having an invisible friend. This gets old real fast – and without Dowd having wonderful things to say throughout, as opposed to just at the end, the script has little spine. 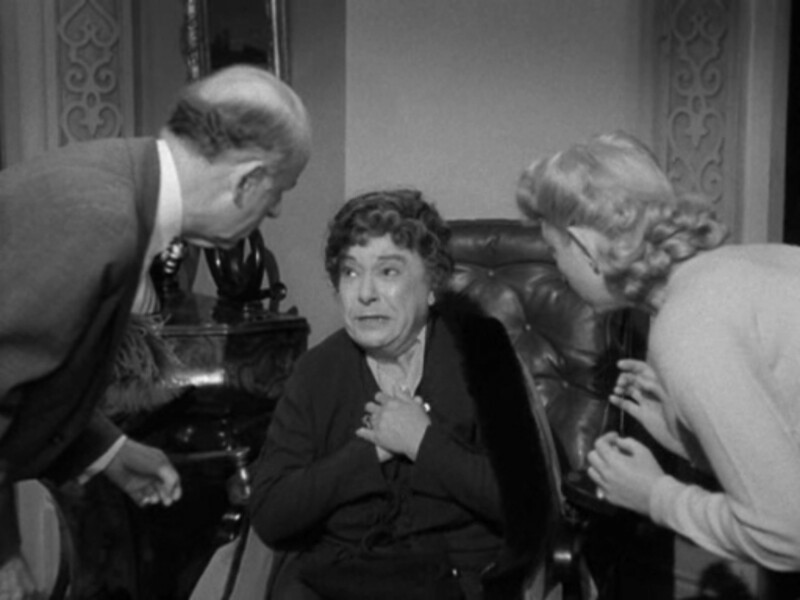 The film is merely a one-note affair until a nice bow wraps things up. The play was a huge Broadway success and won the Pulitzer Prize. The film was a hit as well. But, at the risk of seeming jaded (a risk I take daily), my feeling is that the basic story is pretty terrific – just not executed in its time in a way that’s satisfying now to modern audiences. Note: I made reference to this film in my play ‘I Am My Imaginary Friend’. How could I not?